This dinner is hosted by the Chinese Embassy to thank Save the Children and its donors for their generosity and charitable activities. When I last met Ms Whitbread, I was deeply impressed by her briefing on Save the Children. Save the Children is a charity of major international influence. For over a century, it has been deeply committed to the noble cause of promoting healthy development of children and protecting children’s rights and interests. Save the Children has provided invaluable help to children in plight and suffering in more than 120 countries across the world. To these youngsters, Save the Children indeed has been a torch lightening up their lives in the past, for now and for the future. Children in China are among the beneficiaries. In the 1930s, Save the Children offered help to Chinese victims of floods and the war against Japanese aggression. Since the 1980s Save the Children has carried out a series of charitable programs on children’s health, education, protection and emergency relief. These programs reached out to more than 20 Provinces and Autonomous Regions in China, including Sichuan, Yunnan, Xinjiang and Tibet. In 2012 alone, Save the Children put more than 6 million US dollars into its China programs. This money provided benefits for nearly eight hundred thousand Chinese children. We are honoured and moved that Her Royal Highness Princess Anne, Patron of Save the Children UK, also shown interest and support for the China programmes. It is worth a special mention here that the poverty alleviation office of the Chinese Foreign Ministry has enjoyed excellent co-operation with Save the Children. The Chinese Foreign Ministry and Save the Children have signed a five year MOU on co-operation in poverty reduction. Together, we have run many highly effective education and poverty alleviation programs in Jinping and Malipo counties of China’s Yunnan province. 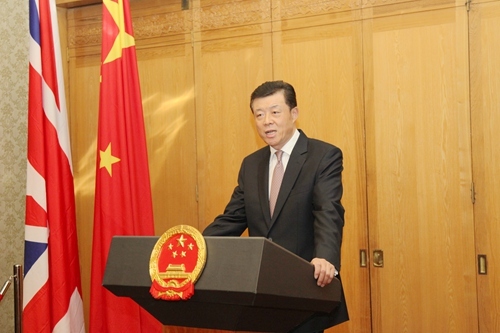 Poverty alleviation in these two counties is the task assigned to the Foreign Ministry by the Chinese Central Government. The collaborative programmes played an important role in improving local primary education and the well-being of many children. This initiative also creates a moving chapter in China-Britain friendship. I want to take this opportunity to sincerely thank Save the Children, the donors and all those who have supported children’s causes in China. Supporting the old and caring for the young is a deeply held traditional virtue of the Chinese nation. There are now more than 200 million children in China. Child protection is one of the Chinese government’s priorities. Significant achievements have been made in boosting children’s health, education and welfare levels. Remarkable progress is made in safeguarding children’s rights and interests. The Third Plenum of the 18th Central Committee of the Communist Party of China not long ago produced what is called for short, the ‘Decision’. The ‘Decision’ describes the comprehensive deepening of reform in China and drew up a ‘blueprint’ for China’s future development. The ‘Decision’ states that China will take better care of children in rural areas whose parents are migrant workers in cities. The aim is to establish a more detailed care system for children in need. The ‘Decision’ also points out that China will introduce a preferential taxation regime for charitable donations. The aim is to encourage charities to play their part in building a caring and loving society. I am sure with the implementation of the ‘Decision’, China’s child protection and charitable causes will make even greater advances. The Chinese government is duty bound to ensure and improve the well-being of Chinese children. But it cannot achieve it alone. China needs the support and cooperation of the whole society as well as international friends. In turn, I hope that Save the Children will continue to support child protection in China. I hope you will seize the opportunities of deepening reform in China. 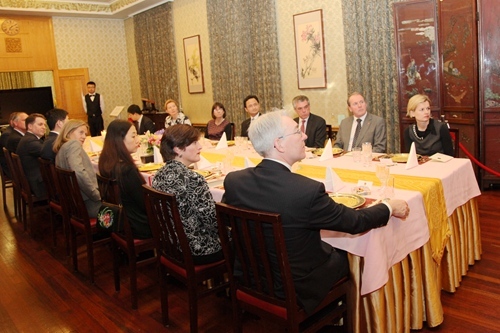 By doing so, you will strengthen cooperation with the Chinese government on all levels and with Chinese NGOs. I hope you will scale up your input in your China programmes, reach your love and care to more Chinese children and contribute more positive energy to China-UK relations. · To the dynamic growth of global children’s causes! · To a bright future of China-UK relations!